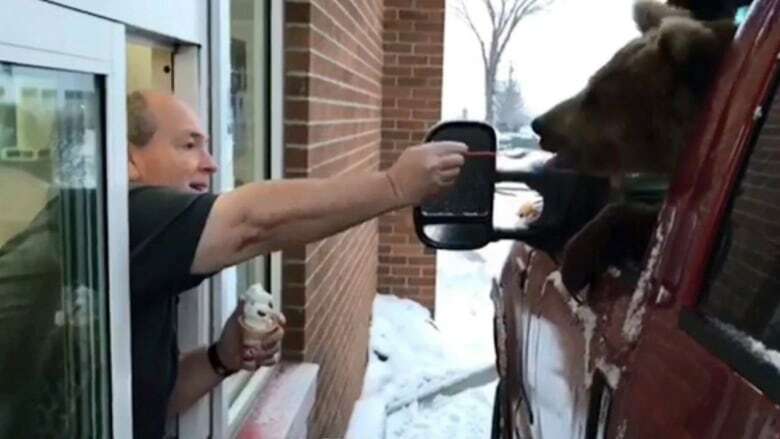 Concerns are being raised about a video of a Kodiak bear from a central Alberta zoo being taken through a fast-food drive-thru and being hand-fed ice cream by the restaurant's owner. The video, posted on social media by the Discovery Wildlife Park in Innisfail, shows a one-year-old captive bear named Berkley leaning out the driver's side of a truck's window for her treat at the local Dairy Queen. "We've got Berkley in the drive-thru testing out some ice cream so she can pick out her birthday cake," says a man identified as Mark in the video. "We've added some peanuts to this batch and she seems to like it — so I think we've got a winner here." Bear experts are calling the video irresponsible and disrespectful. "It's a challenge every day out there in our parks and protected areas to try to teach people who are visiting these places or live here in Alberta that we don't feed wildlife, that we don't feed bears," said Kim Titchener, who runs a business called Bear Safety & More. "We need to conserve and protect them, and respect them." Serena Bos, a trainer at Discovery Wildlife Park, said there was no safety concern because the bear was on a chain in the truck the entire time. "There was never any public present. It was done long before the Dairy Queen even opened," she said. "Berkley is a captive bear, so not a wild bear in any way." Bos said the bear, which is a sub-species of the grizzly bear, came from another facility in the United States and has been well-trained. "We have put out hundreds of conservation messages on social media over the years," said Bos, who noted the park uses its animals as ambassadors to get those messages out. The message in the video with the bear in the truck is about the importance of staying inside a vehicle when a bear is on the side of the highway because they have a keen sense of smell, she said. A second video posted on social media shows the same bear being fed a Dairy Queen ice-cream cake on its birthday. Titchener said the videos go against everything experts are trying to teach people about grizzly bears. "This is not the message that we want to get out there," she said. It's "not part of their natural diet nor is it natural for a bear to be eating an ice-cream cake in the middle of winter when they should be sleeping." Zoocheck, a Canadian-based international wildlife protection charity that looks to protect wild animals, found more than 50 violations of the Alberta zoo standards in a 2015 review of the Discovery Wildlife Park. The World Society for the Protection of Animals (WSPA) said in 2005 that the park was unsafe for both animals and visitors. "Zoocheck and WSPA request that the Government of Alberta to take immediate action to enforce its zoo standards, thereby bringing DWP into compliance with the regulations," stated Zoocheck's 2015 review.